When it comes to the term ‘Crown’, most people understand this to be the same as the monarchy. When socialists are asked why they oppose the British monarchy, they usually concentrate their criticism on the antiquated class structure this upholds; and the high cost of maintaining such a parasitic institution, especially now the rest of us face austerity. However, the UK is a constitutional monarchy . This means the queen exerts little power in her own right. Yes, the royal family enjoys obscene privileges in terms of property, income and status, but these are rewards given for its role in supporting and promoting the interests of a wider British ruling class. Far more important than the monarchy, or the royal family, is the political system it fronts. Despite the existence of a formal parliamentary democracy, centred on Westminster, with its devolved offspring at Holyrood, Cardiff Bay and Stormont, we still face some very real political constraints. These lie in the state’s profoundly anti-democratic Crown Powers. These powers shield a whole host of unsavoury institutions and practices from any public accountability or even scrutiny. They are needed to guarantee continued British ruling class control. This class is made up from the leaders of finance, commerce, industry, the armed forces, judiciary, senior civil servants and key politicians. In 2004, the New Labour government deigned to publicise some of these powers. However, they still kept others secret – so we don’t even know the full extent of what we are up against! New Labour regularly resorted to these powers, most notoriously in the war in Iraq. Tory and Labour governments have used these powers to mobilise troops to break firefighters’ strikes in 1997 and 2002. These powers also cloak the activities of the City of London in secrecy. We can also look at other measures sanctioned under the Crown Powers. In 2012, Guardian journalist, Ian Cobain, published Cruel Britannia: A Secret History of Torture. This shows how the UK state has been able to cover up its continuous use of inhuman treatment, and falsely claim it is not engaged in such practices. Under the Crown Powers, even democratically elected governments can be toppled. Back in 1975, Gough Whitlam fronted a mildly reforming Labour government, which wanted to keep US nuclear warships out of Australian ports. He felt the long arm of the Crown Powers when the British Governor-General removed him from his elected office. The incumbent British Labour government did nothing to help, highlighting Labour’s almost total acceptance of the UK’s undemocratic state. In 1999, under New Labour, the Crown Powers were used to deny the right of the Diego Garcia islanders to return to their Indian Ocean home, when they won their case in the British High Court. Unfortunately for them, Diego Garcia is now the site of a major US military base. However, these powers go even further. They even allow for the suspension of Parliament in ‘extreme situations’, with resort instead to direct rule by the Privy Council. This very select band of former and existing senior government ministers is chosen for its reliability in upholding ruling class interests. Its members all enjoy close contact with the world of business, whilst some have had direct dealings with military officers, MI5 and MI6. Whenever national democratic challenges are made, the British ruling class quickly resorts to the Crown Powers. In 1969, the UK state refused to make any serious attempt to dismantle its sectarian ‘apartheid’ statelet in Northern Ireland, when challenged by the Civil Rights Movement. After forcing this movement off the streets by gunning down 13 unarmed demonstrators in Derry in 1972, the full force of her majesty’s regiments was brought to bear on Irish republicans and nationalists. This included the SAS, the UDR (with its royal patronage) the RUC, and the Loyalist death squads, all backed up by juryless Diplock Courts, manned by Unionist judges, and by detention as required in ‘her majesty’s’ special prisons. Those sections of the state, which provide the ruling class with legal sanction to pursue its own ends, are prefixed ‘her majesty’s’ or ‘royal’. Self-styled Loyalists include those who are prepared to undertake certain illegal tasks when called upon by the security services. But surely, we can take some comfort from the fact that the British ruling class did not resort to such violent measures when the issue of Scottish self-determination was raised in the late 1970s? However, before the mid 1990s, when the majority of the British ruling class concluded that ‘Devolution-all-round’ (for Scotland, Wales and Northern Ireland) was the best strategy to defend its interests in these islands and the wider world, many were bitterly opposed even to very mild constitutional reform. Therefore, in the lead-up to the 1979 Devolution Referendum, the ‘non-political’ Queen was wheeled out to make a Christmas broadcast attacking Scottish nationalism. Senior civil servants were told to ‘bury’ any documents, which could help the Scottish nationalists. Military training exercises were conducted, targeting putative armed Scottish guerrilla forces. The security forces became involved on the nationalist fringe, encouraging anti-English diatribes and actions, to discredit any notion of real Scottish self-determination. But, it was not necessary to resort to more of the Crown Powers, because the Labour government was divided, and the SNP’s challenge was so mild and constitutionalist, the ruling class did not have to go any further. Today, the British ruling class is even more united in its opposition to the SNP government’s ‘Independence-Lite’ proposals. There is no room, under today’s conditions of economic and political crisis, for the SNP’s wannabe Scottish ruling class junior managerial buyout of the local branch of UK plc. This despite their acceptance of the monarchy and hence the continued ability of the UK state to intervene in Scotland; of NATO and hence a continued Scottish commitment to US and British imperial wars; and of the City of London and hence continued imposed austerity. So, how did the British ruling class use those Crown Powers in the recent referendum campaign? They achieved their first objective, under the Edinburgh Agreement signed between the Westminster and Holyrood government. Alex Salmond, himself a Privy Councillor, agreed to the referendum being conducted under Westminster rules. This meant that the official’ Yes’ campaign had to be conducted under much greater official restrictions than the ‘No campaign’, which was able to draw upon those Crown Powers hidden from public scrutiny. It will take thirty years before we know what methods were resorted to, beyond the obviously partisan use of senior civil servants and the BBC. However, the Guardian exposed moves by the Ministry of Defence to have Faslane Trident base declared sovereign UK territory in the event of a ‘Yes’ vote (2). If there had been a ‘Yes’ vote on September 18th, the SNP government did not recognise this as transferring sovereignty to the people of Scotland. They accept the principle that their sovereignty comes from those powers devolved from Westminster to Holyrood. Hence, they had already decided that their negotiating team with Westminster would include MSPs from the Labour, Conservative and Lib-Dem parties, and possibly even some of their Scottish MPs. The low level of Scottish self-determination, already accepted under the SNP government’s ‘Independence-Lite’ proposals, would have been further whittled away under Westminster sovereignty. In contrast, the Radical Independence Campaign, at its May 17th, 2014 National Forum, drew up a very different set of proposals in the event of a ‘Yes’ vote (3). These involved making a direct appeal to all those autonomous ‘Yes’ campaigning groups to join a popular campaign to draw up a new Scottish constitution to be put before a Scottish constituent assembly. A ‘Yes’ vote on September 18th, would have been seen as an exercise in the republican principle of sovereignty of the Scottish people. This is the democratic answer to a UK state, based on the anti-democratic principle of the Crown-in-parliament. The Anti-Poll Tax campaign in Scotland successfully invoked Scottish popular sovereignty against Westminster sovereignty, when Thatcher’s Tories tried to impose this tax upon Scotland first. Current campaigns, such as that against Trident, can also draw strength by invoking the republican democratic principle of the sovereignty of the people. Allan Armstrong is a member of the Republican Communist Network and is a contributor to Emancipation & Liberation. 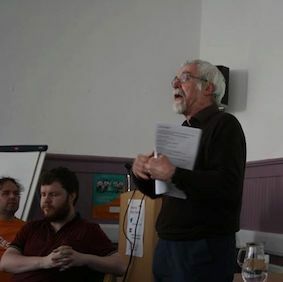 Allan has been involved in the Radical Independence Campaign. He was the Chair of the Lothians Anti-Poll Tax Federation. Allan has written From Davitt to Connolly, and the Ghost of James Connolly (about Connolly’s years in Edinburgh). He is also a contributor to the RCN pamphlet, Republicanism, Socialism and Democracy and to Unstated – Scottish Writers and Independence.